As promised, we are continuing to push new features out in Handbid and keep you informed along the way. While this release has more "behind the scenes" fixes than new features, there are still some cool things released we are excited to tell you about. If you have hung around us for any length of time, or if you have read through our blog articles, you will know that we are not big fans of a watchlist. This is not because, we don't see the value to the user (we do with some respect), but because we feel that a watch list allows a bidder to "lurk" and not bid. However, we also find that some auctions could really benefit from one because they have so many items. Therefore, we have implemented a Handbid favorites feature. This is a small add but one we think will be quite useful for managers who want to generate their own display sheets. 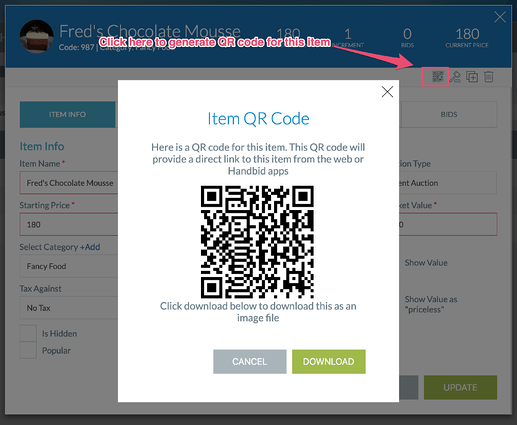 We have had item QR codes for quite some time, but we have not (until now) given anyone the ability to generate and download them for use elsewhere. In addition to these new features, we have a few upgrades and fixes we want to bring to your attention. One important one is tracking an organization's ability to accept donations. Your org now must be registered as a charity in our system in order to add or edit any donation item (appeal or Puzzle). This restriction is in place in order for us to remain compliant with Tax laws as well as with our App partners like Google. If you get an error, don't fret, it is an easy task on our end to enable it. We have run though a number of you and enabled it based on a check with Guidestar. If you run into a "Not Authorized" error, just reach out to service to confirm you are enabled. • Managers can now delete sponsor images and the mobile splash image. You could always replace them, but now you can completely remove them. • The iPhone app now properly frames images on the X, XS, XS Max and XR. While most phones properly handle the 4:3 dimensions we recommend, these phones don't. So in order to preserve the photos (and not crop them), we put borders on the images. • Some of you have HUGE guest lists and want to know how long it will take to upload. Now we do our best to tell you! There is a time-remaining estimator on the guest list uploader. • In addition, the guest list uploaded now also lets you upload custom guest status values. • The auction receipt was showing the org address instead of the user's address. That is fixed! • The purchases report was missing the item code. It was there, then it ran away and hid. We found it and put it back in its place! • We have gone back and forth on this but have now decided that donations should be available during preview, presale and closed statuses (as well as when the auction is open). If you want to halt donations, put your auction in PAUSED mode. Sorry, the "we want this to happen" crowd has drowned out the "we don't want this to happen crowd." • We have changed how TEST auctions are created. Test auctions are not designed to be a "preview" auction. Instead, they are there to test functionality (with a 5 item limit). So now they are created differently and each account can have one. And, to avoid to confusion, test auction names start with "TEST |"
Well those were the overall highlights from our 2.22 release. We left out a lot of the smaller (less interesting) updates but hope you find these upgrades to be helpful. 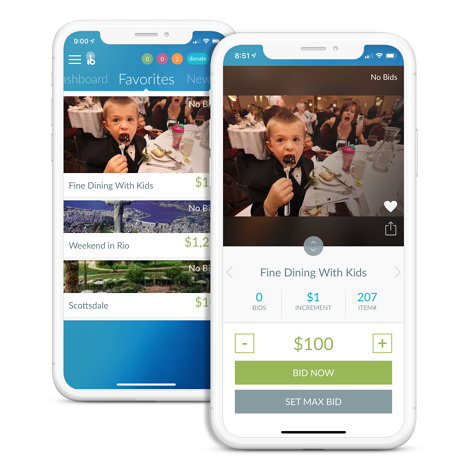 If you have any questions about some of these new enhancements; or, if you have any suggestions of your own, please reach out to us at service@handbid.com!